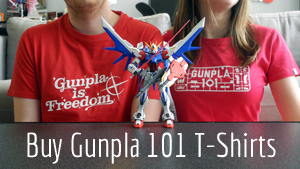 I love Gunpla so much, I don’t only build them for my own blog. I also review figures and Gundam model kits for Anime News Network. This spring, Bluefin sent me one of their more challenging offerings, the Master Grade Build Gundam Mark II. It’s based off of a briefly-used model from Gundam Build Fighters, which is itself nearly identical to the AEUG Gundam Mark II in Mobile Suit Zeta Gundam. In fact, this 2014 Gunpla kit uses all the same parts as the Master Grade Mark II, but has a new V-fin, a booster backpack, and some other cool accessories. In short, it was new to me, but maybe not new to people who’ve built the previous kit! I loved how it had some real heft to it. It feels way more substantial than my last Master Grade build, the Strike Rouge. It made me realize that after six years of Gunpla modeling, I finally feel not only up to the challenge of a Master Grade, but relaxed and comfortable while I build it. Check out the entire article on Anime News Network to see my step-by-step process.